Our good friends at Chimney Rock Park gave us a great fall foliage report this week. What a pretty place, and what a great place for hiking. We loved our trip there in April of last year. 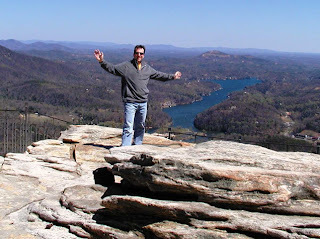 Here’s Dave standing on top of the “chimney” with Lake Lure in the backround. Pretty nice scenery behind him, huh? Brigette has a fear of falling, so she was huddled partially behind a rock, gripping onto it while taking Dave’s picture. The rest of the day was spent hiking up to the top of the falls and back. Very spectacular views! We suggest a leisurely scenic drive to Chimney Rock if you’re in the area this weekend or next week. It’s just a half hour south of us via Route 9 out of Black Mountain. On the way back, if you want to take a different route, you can head up US-64/74 to Asheville (or stay on US-64 to get to Hendersonville, south of Asheville). This entry was posted in Uncategorized and tagged Autumn / fall foliage, hiking, outdoors by Inn on Mill Creek. Bookmark the permalink.